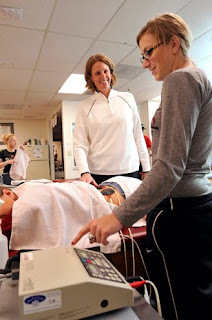 The Honors and Awards Committee of the National Athletic Trainers' Association (NATA) recently announced that Melinda Larson, '92, was selected to receive the association's national service award. NATA is the professional membership association for certified athletic trainers and others who support the athletic training profession. Founded in 1950, the organization has grown to more than 30,000 members worldwide today. Larson's recognition is the result of her contributions to the athletic training profession and to the association. Although this is a national honor, local, state and district service are its focus. One of Larson's nominators stated that "Melinda's heart is in service. She sacrificially gives of her time, talents, and resources to further the development of our profession. She serves on NATA's Continuing Education Committee, where her role is to identify and apply current literature/content and develop national programs for the continuing education of Athletic Trainers. "She is also considered the 'go to' person in District 10 (Alaska, Washington, Oregon, Idaho and Montana) when we need someone to meet a need. She was a member of the local organizing committee for the District 10 Annual Meeting and Clinical Symposium, putting together the program and running the registration for the meeting. When a scheduled speaker canceled, she jumped in and presented on therapeutic modalities. "Last June, when our mentor for the district student leadership committee was unable to attend the NATA meeting in San Antonio, Melinda stepped forward and organized our District 10 Student Quiz Bowl team. "She has been president of the Northwest Conference Athletic Trainers, and in that capacity she has united the ATs in our league to provide exceptional healthcare to all the athletes in our conference. Melinda is a wise counselor and has served in an advisory capacity to ATs throughout the profession." Another colleague states that "Melinda is respected by her colleagues as a person of integrity and wisdom. She is conscientious and professional." Larson is currently the head athletic trainer and an associate professor in the regionally acclaimed Whitworth Athletic Training Education Program. Located in Spokane, Wash., Whitworth is a private liberal arts university affiliated with the Presbyterian Church (USA). The university, which has an enrollment of 2,700 students, offers 55 undergraduate and graduate programs.